The best way to begin searching for homes in Utah is to click the button to the right where you can perform a comprehensive home search of any home on the market! Welcome to the site with the best tools on the web for finding currently listed homes for sale in Utah. Our site includes every active listing of all active Northern Utah Homes for sale that are listed on the WFRMLS (Wasatch Front Regional Multiple Listing Service), which mainly focuses on homes for sale from Provo all the way up to Logan, which covers roughly 80% of Utah’s population. Chances are that for your Utah home search, you already have a specific style of home, and a specific area in mind such as a certain neighborhood or school you’d like to live near. Our mission is to provide you with the best tools which will make your new home search quick and stress free. We are dedicated to getting you quick access to the home which fits your style and needs. We allow you to have a basic experience of all the homes for sale in Utah, before ever taking step in the home which you are interested in purchasing. Explore pictures of the house for sale, and depending on the listing you may even be able to experience virtual tours. We also provide access to realtors throughout Utah who are ready at a moments notice to be able to show you any of the homes listed here. Home details may include specific number of bedrooms, square footage, and extra amenities. This is why we provide the advanced search, which helps your sort through several different options to find your ideal home in Utah. For example, you can also compare the homes you are looking at with other homes in the neighborhood, search by very specific criteria including neighborhoods, horse property, homes near golf courses, homes with pools, and many other features by using our advanced search. View multiple pictures of each real estate listing or take a virtual tour of the neighborhood using Google street view and aerial images. Utah presents more recreational opportunity than anywhere else in the world. With an incredibly diverse climate, each season is lived to the fullest, creating enjoyment opportunities which keep things lively through every season. In the winter residents and tourists enjoy the world class skiing, snowmobiling, ice fishing, and every other winter activity you can think of. In the summer, boating, hiking, cycling, and every extreme sport (minus surfing) is also enjoyed in Utah. People who live here note the friendliness of their neighbors and the quick bonds that are built. Citizens take pride in the numerous activities which they can enjoy here. With both small town living, and the big city close by, Utah has the best of all worlds. Utah is a also a very unique state. It has the youngest population, and a high number of families. Much of the housing reflects the lifestyle of its residents. Utah has a high home ownership rate, and a large percentage of single family residences. A large selection of different home types and styles can be found in Utah. The most common Utah Home style is probably the ranch/rambler, but two story homes, bungalows, split entry, and tri-level homes are also very common. The average home in Northern Utah is about 2,400 square feet, with four bedrooms and two bathrooms. 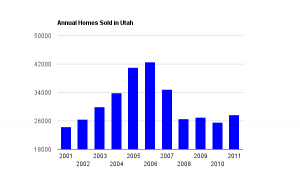 Home sales and real estate values in Utah have varied greatly over the last decade. Home prices peaked in 2008, and have declined annually since. With a strong economy, the real estate market in Utah appears to have hit bottom and is now recovering. During 2011, 27,685 Utah homes sold in the areas covered by the Wasatch Front Regional MLS. The median price of homes sold in Utah was $175,000 with an average price of $212,242. In comparison, during 2007 the median sales price was $213,861 with an average price of $257,832. 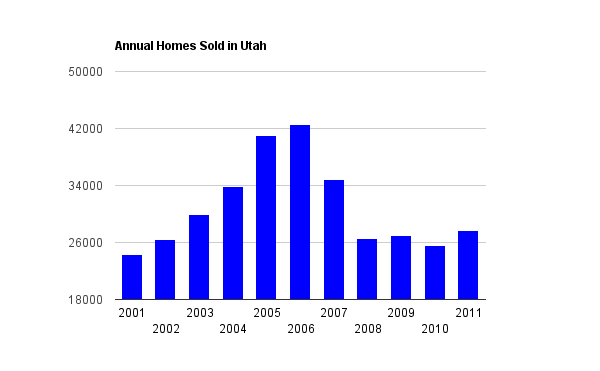 During 2006, a total of 42,538 Utah Homes sold. Current low interest rates, combined with low housing prices make it an excellent time to buy Utah Real Estate. With the changing real estate market and declining home prices in Utah, there are lots of foreclosure and short sale homes. These properties can represent substantial deals. 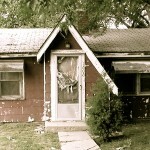 Purchasing foreclosures can and short sales can be tricky though. They take more time and are not as certain as purchasing other types of Utah Homes. With home prices expected to decline throughout most of Utah during 2011, the number of foreclosure homes will likely remain high for a few more years. A short sale is a home that is being sold prior to a foreclosure, which is why it falls under the category of “distressed” housing. Short sales are hot items among those who are looking for deals on real estate, especially investors, because the potential to buy low and sell high is very likely. Purchasing a short sale is not for everybody. There is an approval process which takes some time, and you may not be guaranteed the short sale, as most of them have many offers on them. If you have time on your side and little to lose, browsing short sales is an excellent idea. From the time that Utah was establish in 1847, it has experienced rapid growth. The last ten years have been no exception, Utah has grown by 26% in just a decade, making it the fastest growing state in the country. According to the 2010 census, there were 2,763,885 residents in the state of Utah. Going from north to south, Logan is the first metro area in Utah. The metro area is tucked into it’s own valley, also known as Cache Valley. This unique setting puts Logan out of the beaten path, but helps preserve its community feel. It also makes for gorgeous mountain views, with Logan peak to the east, and the gorgeous Wellsville mountain range to the west. A student population of just over 20,000 attends Utah State University, which is also the main employer of the area. Because of the attendance and employment, a large portion of the Logan area’s economy is dependent on the university. In an area where residents sometimes have to make their own entertainment, Logan also has an endless list of outdoors activities. Some of the most beautiful sites in Utah are found in this gorgeous area. The Ogden metro is a sprawling area with the most diversity within the state. Along the foothills and benches of Ogden is where the most prized real estate, and highest income families are located. Ogden has had a reputation for being a less desirable area in Utah, but with new developments Ogden has been quickly changing that reputation and and has become a great place to visit and raise a family. The Salt Lake City metro is the largest in Utah. The activities in this city are limitless, as the city itself offers a host of entertaining activities, such as the Utah Jazz or Réal Salt Lake. If you are looking for activities outside of the city, a drive of just a few minutes and you can find yourself enjoying the peace and solitude of the mountains. Home to the famous BYU Cougars which attracts students from across the United States, and the less famous UVU which attracts students from around Utah. Provo is home to not just a large university student population, but hundreds of entrepreneurs and aspiring businesses. Saint George is almost considered a resort town. During the winter months, northern Utah citizens flock to Saint George. But even in the summer months, this city is bustling with tourists who have come for the natural wonder and beauty that St. George is.